The incident began with an account of a meeting written by Angela Gui, whose father Gui Minhai, 54, was allegedly abducted by Chinese agents in 2015. What did Ms Gui say happened? Ms Gui, who is studying for a PhD at Cambridge University and has campaigned for her father's release, wrote that she was contacted by Ms Lindstedt last month with an invitation to a meet a group of Chinese businessmen who said they had connections to the Chinese Communist Party. Ms Gui's account of the meeting, posted on the blogging site Medium, described a "very strange experience" in late January which she said took place over two days. According to Ms Gui, Ms Lindstedt contacted her to say there was "a new approach" to her father's case. "She didn't explain very much, but said that there were some businessmen she thought could help, and that they wanted to meet me in Stockholm," Ms Gui wrote. She flew to Stockholm and checked in to a hotel where they had arranged to meet. From there she was taken to a members' lounge in the hotel, she said, with the businessmen and Ms Lindstedt. "There was a lot of wine, a lot of people, and a lot of increasingly strange questions," Ms Gui wrote. "But because Ambassador Lindstedt was present and seemingly supportive of whatever it was that was going on, I kept assuming that this had been initiated by the Swedish foreign ministry." She said one of the businessmen pressured her to accept a deal where her father would go to trial and might be sentenced to "a few years" in prison, and in return she would stop all publicity around her father's detention. According to Ms Gui's account, Ms Lindstedt was supportive of the arrangement, telling her that China was "adopting a new diplomatic line" and that, if her publicity continued, China might "punish Sweden". What has the Swedish foreign ministry said? After Ms Gui left the meeting she returned to the UK and contacted the Swedish foreign ministry. She was told the office knew nothing of the arrangement, or even that Ms Lindstedt was in the country. The Swedish foreign ministry confirmed to the BBC that it had no advance knowledge of the meeting and said Ms Lindstedt was subject to an internal investigation. It was announced in January that Ms Lindstedt would take up a new government role in March working on implementation of global sustainability goals. The foreign ministry did not comment on whether her recall to Sweden would affect that appointment. He went missing while on vacation in Thailand in 2015 and later turned up on Chinese state television where he was shown confessing to a 2003 drink driving incident in Ningbo. 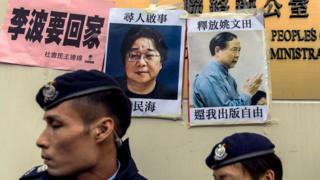 He was one of five men associated with Causeway Bay bookshop and Mighty Current publishing house in Hong Kong who disappeared between October and December 2015. All five later reappeared in custody on mainland China. Mighty Current published thinly veiled, often racy accounts of the lives of Chinese leaders. Mr Gui completed a two-year sentence for an alleged traffic offence and was released in 2017. He was re-arrested by Chinese agents in January 2018, accused of leaking state secrets abroad, and has been in detention in mainland China since.